Place a medium-large pot of water over high heat, and add a good amount of salt so that it tastes like sea water; squeeze in the lemon and stir to combine, and bring to the boil. Once the water boils, add in the asparagus, and blanch them for about 30 seconds – 1 minutes; remove from water and plunge into an ice water bath to shock the asparagus and stop if from further cooking, then drain and pat dry with paper towels. Prepare your breading area by getting your flour ready in one bowl or container, your whisked eggs in another, and the panko breadcrumbs combined with the parmesan in another. 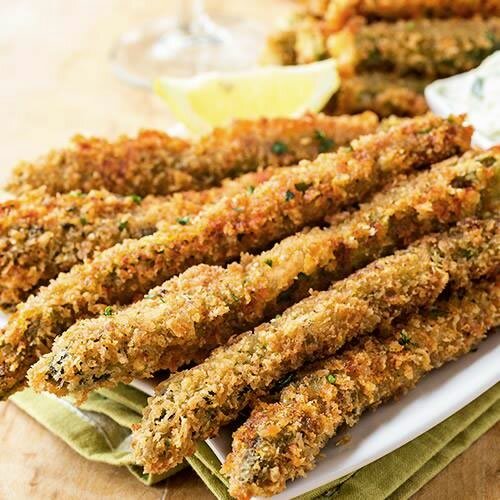 Dip the asparagus spears into the flour to coat, then into the eggs, then into the panko-parmesan mixture to coat; set aside on a large platter, and repeat until all are coated. Heat enough oil in a large skillet or pan to generously cover the bottom (enough for shallow frying), and once hot, begin adding batches of the coated asparagus spears and fry, turning them once, until golden-brown and crisp; drain on wire racks, and repeat with all coated asparagus; sprinkle with a bit of paprika to finish. Serve with the Lemony Sun-Dried Tomato Aioli sauce. Cauliflower Fried “Rice” Low Carb – So Delicious! Perfect Weeknight. So who doesn’t love fried rice? It’s a shame it’s not so healthy – until now! 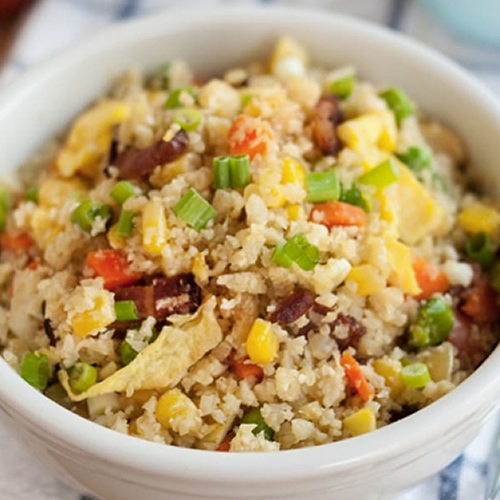 Substituting shaved cauliflower for rice is a stroke of genius! It has also brought Chinese fried rice, once relegated to the “comfort food” category, into a weeknight meal rotation. As a fried rice look-alike, this dish can hold its own. The cauliflower is chewy and nubbly in all the right rice-like ways. Bits of egg and tender vegetables also make it a satisfying meal on its own. This still feels like comfort food – just comfort food that’s sneaking a few more vegetables into your day! Cook the bacon in a large frying pan over medium heat until crispy. Transfer to a plate lined with a paper towel to drain. Once cooled, roughly chop into pieces. Drain off all but a teaspoon of bacon fat (or use 1 teaspoon vegetable oil), reserving the grease. Wipe the pan clean and warm 1 tablespoon of bacon fat or vegetable oil over medium-high heat. Add the ginger and garlic, and sauté until fragrant, about 30 seconds. Stir in the carrots and sauté until crisp-tender, 2 minutes. Stir the corn, peas, and cauliflower "rice" into the pan, mixing the ingredients thoroughly. This recipe is a great way to jazz up a traditional roast, where the chicken is marinated in yoghurt and spices making it incredibly tender. The flavours here are really fantastic and it’s worth the marinating time. 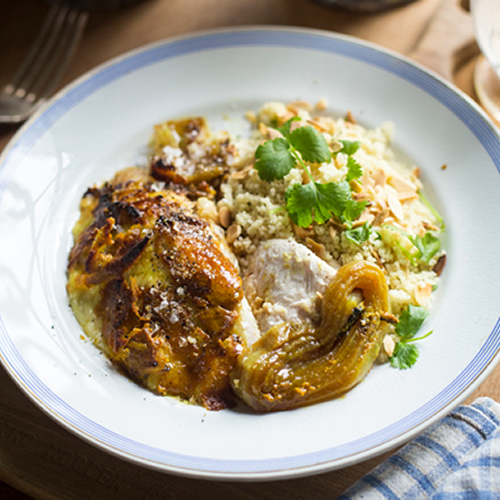 When served on a bed of cardamom couscous, this really becomes something special. To make the marinade, mix the garlic, ginger, cumin, coriander, garam masala, turmeric, paprika, olive oil and yogurt in a large bowl and season with salt and pepper. Slash the chicken legs several times with a sharp knife, then rub the marinade all over the chicken, both inside and out. If time allows put the chicken in a large food bag, or covered in a non-metallic dish, and leave to marinate for at least 4 hours, or up to 24 hours is best. Take chicken out of the fridge 30 minutes before it goes into the oven. Preheat the oven to 230°C. Lay the onions in an oval casserole dish or non metallic roasting pan and then drizzle over the grapeseed oil. Season with salt and pepper and sit the chicken on top. Put the lemon inside the chicken’s cavity and place in the oven and immediately reduce the heat to 200C. Cover the chicken loosely with foil and roast for 30 minutes. Remove the foil and roast for another 50 minutes, basting the chicken halfway through cooking. Meanwhile, prepare the couscous. Bash the cardamom pods with the back of a knife and place them in a bowl with the couscous. Add the stock granules and cover with boiling water, cover with cling film and leave until all the water has been soaked up and the couscous is nice a plump. Using a fork fluff up the couscous when it’s ready and fold in the coriander and almonds. Let the chicken rest for 10 minutes before you carve it, then arrange on warmed serving plates with the onions and couscous to serve then drizzle with pan juices. NOTE: You will need a non metallic roasting dish so the acid in the lemon juice doesn't react with it.